In May we discussed "How to Make Pulses Useful" and briefly touched on the topic of using pulses for peak demand management. Pulses are also used for other energy recording purposes, telemetry devices, SCADA systems, etc. Many times the utility or customer needs to track energy use information using KYZ pulses. To accomplish this the utility must install a pulse initiator board into the electric meter and program it for the pulse constant. Most pulse boards provide some protection against voltage spikes but rarely do they provide protection against over-current faults. This is where Pulse Isolation Products come in. Although they’ve all harmed their fair share of meters and other expensive electrical equipment… the most common, and by far most destructive type of transient damage is Lightning. 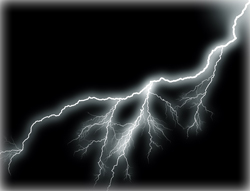 Nothing will protect your electrical equipment from a direct lightning strike. Chances of a direct strike are slim, but the probability of being affected by the electrical charge from a nearby strike is high. When thinking of lightning, most people focus specifically on the lightning bolt and the damage related to that particular strike. However, there are indirect effects that also result from a strike. The two most common secondary effects that cause damage to electrical equipment are Earth Potential Rise and Electromagnetic Field Effect. When a lightning strike makes contact with the ground thousands of amps are placed into the earth causing an increase in voltage in the surrounding area. This voltage can travel through the ground to wire and/or electrical equipment possibly causing transient damage. EPR is also referred to as Ground Potential Rise. 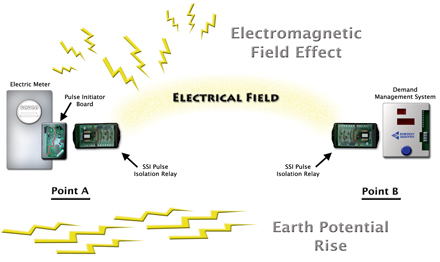 The on-off-on-off action of a lightning strike causes the electromagnetic field surrounding the strike to induce currents. These currents can be picked up by, or travel to nearby conductors, such as wires and/or electrical equipment possibly causing transient damage. Fortunately, pulse products such as a SSI Pulse Isolation Relay can increase protection by providing additional dielectric barriers that transients or power surges would have to break through before reaching the electrical equipment. To understand this better lets look at the barriers provided on a typical pulse initiator board supplied by the utility. 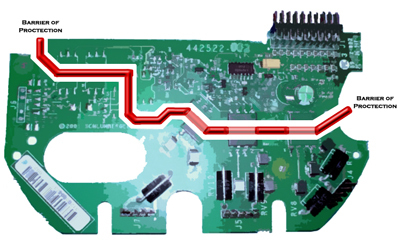 The red line is the Barrier of Protection that is in place to prevent power spikes from reaching the other end of the board. This is typically provided by an optically-coupled device having an isolation voltage from 2,500-5,000 volts. Below is the electrical board for one of our pulse isolation relays. 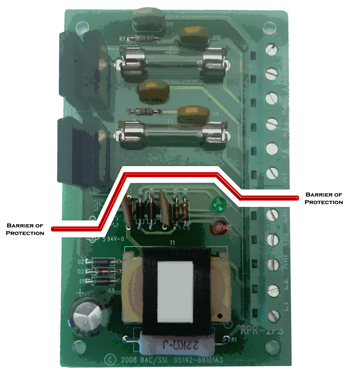 Below is a diagram showing the configuration of a meter, pulse initiator board, and isolation relay and the barriers of protection that the electrical discharge would have to travel through. On the other end you may also have another pulse isolation relay being used to protect complex energy equipment like a SCADA system, telemetry device, energy recording device, or in this case a demand management system. If lightning were to strike nearby, the electrical field between Point A and Point B would attract the voltage and current surges (caused by secondary effects) sending a power spike through the field to either end of the configuration. The greater the distance between Point A and Point B, the higher the probability of attraction. The isolation relay would be the first point of contact that the power spike would have to break through. If the power spike managed to travel through all the barriers of the SSI board it would still need to travel through the barriers in the utility pulse board before it could reach the meter or other electrical equipment. In most situations the SSI relay is sufficient enough protection to prevent further travel of the power spike. If damage were to occur, it would most likely only affect the SSI relay, which is MUCH LESS Expensive than the total cost to replace the meter or other complex energy equipment. As with most things, your level of protection can vary from somewhat basic to more advanced. It really depends on what type of equipment you’re working with and what types of transient damage you are trying to protect it from. Solid State Instruments provides several variations on Pulse Isolation Relays. Below are a few relays that are commonly used for protection. The most basic function of these relays is to act as a protective barrier between “the outside world” and the electrical equipment. As discussed above, if lightning were to strike nearby the SSI relay would absorb the impact of the power spike instead of your equipment. These relays also offer additional benefits such as, filtering out electrical noise, providing additional outputs, and individual over-current protection on each output. Given that there are so many forms of transient damage, it has become somewhat customary to provide protection for expensive electrical equipment. And guess what? All of these SSI pulse isolation relays are much less expensive than the total cost to replace the electric meter or other complex energy devices. By purchasing a relatively inexpensive SSI relay, you are not only protecting your equipment but you are protecting your wallet! Like the old saying goes… “Better to be safe than sorry!